An unfortunate truth about the world today is the simple fact that automobile accidents happen every day. Distracted driving is a leading cause of accidents today. Couple that with bad weather and you have the perfect recipe for disaster. Whether it is snow, sleet, rain, or ice, roadways can become slick and visibility can turn minimal. In certain scenarios many people still need to travel and that leads to even more unfortunate accidents on the road. As a motorist on the road just hoping to make it safely to your destination, there are a handful of simple tips you should follow before hitting the road. Headlights and indicator lights (blinkers/hazards) are on your vehicle for a reason. First and foremost, they make it easier for you to see the road and any hazards that come with it. In New Jersey the rule of thumb is that if your windshield wipers are on, then your headlights should be on too. When weather gets bad, like in heavy rain or snow, your headlights can help you see any dangers that may lie ahead. They also help by making you visible to other motorists on the road. And most importantly, using your indicator lights can make all the difference when on the road. They let other vehicles know which way you are turning and they can adjust accordingly by giving themselves enough time to slow down. Obviously it is not a race, but when it comes to driving in bad weather, slow is the name of the game. You should be sure to drive slowly to avoid sliding when turning and when stopping. Bad weather like rain, snow, sleet and ice can make road surfaces slick, making it more difficult for your tires to grip. If you travel too fast it will be difficult to stop. You should also think slow when it comes to stopping. Allow yourself extra stopping time and slowly pump the brakes when trying to stop. Do your best to avoid slamming on the brakes or else you may end up sliding uncontrollably. One easy way to make sure you can safely drive in bad weather is to make sure your vehicle is in working order long before the weather comes. That means regularly getting your car tuned up. Things like the car’s battery, fuel and emission filters, tires and windshield wipers should always be checked and in working order. If you live in an area that normally gets a decent amount of snow, having certain items stocked up can also help. Kitty litter or salt can help if you get stuck and tire chains can be put on vehicles that do not have good grip in snow. It is always advisable to have an ice scraper and shovel handy as well. 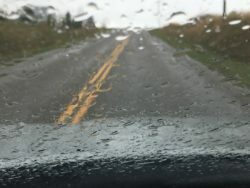 If you remain careful on the road when driving in bad weather you greatly increase your chances of avoiding an accident. Unfortunately, not everyone on the road exercises such caution and that is why accidents continue to happen. If you or a loved one has been injured in a motor vehicle accident due to the negligence of another then you should contact the Law Offices of Richard A. Stoloff in New Jersey. Richard A. Stoloff has over 25 years of experience helping victims of automobile accidents. He will help you get the compensation you deserve while you concentrate on recovering. To arrange a free consultation and begin discussing your legal options, call 609-601-2233 today.